Raise Your Hand and More Than A Score are drawing people’s attention to this amazing meeting of the Evanston Township High School District 202 Board, which took place on September 22, 2014, Officials engaged in a brutally honest discussion about the pitfalls of the PARCC tests that will leave your jaw on the table. According to the testimony, one of the accomodations prescribed by PARCC for ELL students is for the proctor to read the test question SLOWLY and at an increased volume. Not kidding. The BOE official is disgusted at PARCC’s insensitivty. BOE officials opine that they do not wish to administer PARCC exams because they are not in the business of harming students. The states presently participating in Pearson’s PARCC platform tests are Arkansas, Colorado, Illinois, Maryland, Massachusetts, Mississippi, New Jersey, New Mexico, Ohio, Rhode Island, and the territory, Washington, DC. Meanwhile, back in NYS, SED released a memo with plans to field test the PARCC assessments in a few weeks. Districts are being asked to contact SED to sign up for PARCC field tests. The deadline is December 19th. Please email your districts urging them NOT to volunteer your children for this. SED is bribing districts to do this by saying they will be “exempt” from regular field testing if they volunteer. Although the Board of Regents is trying to make field tests mandatory, as of now, the standard field tests are NOT mandatory, and districts can refuse to administer. PARCC is down to ten states and DC for 2014-15. Can we make it 9 by getting NYS to ditch PARCC as well???! In September, the school board of Evanston Township in Illinois held a meeting at which there was a disturbing discussion about the PARCC exam, the new Common Core test that will be administered to students for the first time this year there and in about a dozen states as well as the District of Columbia. Virtually nothing has changed since the meeting was held, and he has written memos since then further spelling out problems. In the video below and a Nov. 3 memo he sent to two superintendents, Bavis describes concerns he has regarding logistics of administering the exam, its educational soundness and effect on students, and the financial cost. PARCC stands for the Partnership for Assessment of Readiness for College and Careers, which is one of two multi-state consortia that received a combined $360 million from the Obama administration to develop new tests aligned to the Common Core state standards. Bavis isn’t the only educator or administrator in Illinois to express concern with PARCC; in October, Barbara Byrd-Bennet, the chief executive of the Chicago Public School, said she wants to delay using the PARCC this year because she said there still remain “too many question about PARCC to know how this new test provides more for teachers, students, parents, and principals than we are already providing through our current assessment strategies.” The state, which is spending $57 million on the initiative this school year, isn’t going to give the waiver. Students taking both PARCC mathematics and reading language arts tests will spend more time taking PARCC tests than aspiring lawyers will spend sitting for the Bar Exam with no payoff. This is true in elementary, middle school and high school. Watch the video. It’s not long. There are several educational and logistical concerns regarding PARCC implementation. The purpose of this memo is to enumerate those concerns. Administrators will be available to discuss these concerns with the school boards at the joint board meeting. PARCC testing trades off with instruction at a critical time of year. ETHS has allotted 5 days to PARCC testing within a compressed timeframe in the spring. We do not know if that will be sufficient to complete required testing. We plan on testing 738 students enrolled in 2 Algebra and 687 students enrolled in 3 English. Our 2 Algebra enrollment is comprised of students in grades 9-12. Our 3 English enrollment is comprised of juniors. This cross grade level testing means that all instruction during the 5 days of PARCC testing will be significantly disrupted and will impact nearly all of our classes. PARCC testing occurs between the state sponsored ACT (March 3) and continues through May 22. PARCC requires 2 test administrations for math and English Language Arts. AT ETHS we chose to test the second administration of PARCC before AP exams. However, the state window for PARCC testing conflicts with AP exam administration. Last year ETHS had over 400 juniors take AP exams. Many of them took more than one exam. This means that a junior taking multiple AP classes stands to miss more than a week of instruction (5 days to PARCC, 1 day to ACT) in addition to their AP testing dates. Testing fatigue and student wellbeing are major concerns for our juniors. Compressing ACT, PARCC, and AP within a 44 school day window has the potential to result in lower test scores on ACT and AP exams. If ACT counts for college admission, and AP counts for college placement/credit, then what is the value of PARCC beyond 5 days of additional testing in the spring? As a result of PARCC testing requirements, ISBE has moved the statewide ACT a month and a half earlier to March 3. Early administration of the ACT results in lower scores for our students. Lower test scores have the potential to negatively impact college admissions for some of our students. Despite claims made by PARCC, PARCC is not being used for college admissions. Unlike the ACT and SAT, PARCC is not a national standardized test. In fact, only 11 states are administering PARCC. This is down from the initial commitment of 23 states. The advantage of ACT is that potentially college-bound students must take it seriously. For PARCC to command similar respect from test-takers, it must earn the respect of colleges to the extent that they will use it in place of an ACT or SAT. Colleges cannot do that without first validating the tests. This will take years. The same holds true for the “talk” about having PARCC used for placement. There are several logistical concerns regarding rollout from ISBE. For example, information regarding PARCC testing has not been provided in a timely manner. Each spring schools are required by ISBE to submit their school calendars for approval. High schools did not know what courses were being tested until this summer. This is disruptive to planning the school year and planning instruction. It takes about a year lead time to thoughtfully plan for standardized testing. ISBE has not issued guidelines on attendance during ACT or PARCC testing. However, ISBE is clear about not allowing students or districts to opt out of testing (APPENDIX). ETHS’ top students will not test in math. ETHS has a number of 9th graders enrolled in math course work beyond 2 Algebra. Since so many of our high achieving math students have been eliminated from PARCC assessments we will not be able to make reliable school-to-school comparisons. We have been told that scores will be “banked.” This means that the scores for students who take algebra, geometry, and 2 Algebra in middle school will belong to ETHS. In contrast, these students took the PSAE ACT as juniors in the past. High schools do not know what PARCC tests will be administered in future years. We know that PARCC has developed tests for 2 English Language Arts, Geometry, 1 English Language Arts, and 1 Algebra. PARCC is not being thought of as a means to demonstrate student growth if there is no intention to measure students longitudinally in high school. In fact, it appears that we are going in the opposite direction by starting with 3 English Language Arts and 2 Algebra. There are hidden costs associated with PARCC. ISBE will spend $57 million on testing this year. This price tag does not include technology costs associated with testing (computers, headphones and other infrastructure requirements). These test administrative costs are passed on to districts. Finally, there is the matter of trust. When PARCC officials spoke to the Illinois Board of Higher Education (IBHE) they stated that high schools were on board with PARCC testing. This is simply untrue. At that meeting IBHE was also told that state funding for ACT would cease in 2017. Clearly there is a lack of transparency in this process. We have been told that the state is bound by federal regulations. But this does not explain how other states were able to opt out of PARCC. This issue deserves more than a bureaucratic shrug of the shoulders. It is helpful to look at the impact PARCC testing will have on a student. Let’s take Angie, an African American female student as an example. She is taking 2 Algebra, English Language and Comp AP, and US History AP. She will take the ACT plus writing on March 3, PARCC testing in 2 Algebra and 3 English Language Arts (PBA and EOY), AP testing in English Language and Comp and AP US History. TOTAL TIME testing: 25 hours 40 minutes. Sixty-one percent of the time Angie will spend testing does not count for college admission, credit or placement. It gets worse; Angie will lose five days of instruction between the ACT and AP exams. There is also the issue of testing fatigue. Many of our juniors find themselves in the same situation as Angie. There is also the matter of cut scores. Last year ISBE stated that “Our high school test, the Prairie State Achievement Exam (PSAE), is aligned with the ACT and does provide a good indicator of college and career readiness.” Now we are being told that it is insufficient. 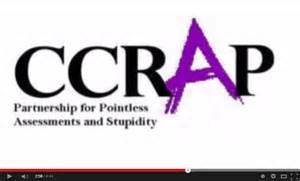 We do know that ISBE intends to crosswalk PARCC to ACT because ACT is the gold standard. To be clear ISBE wants to replace a proven measure of college and career readiness with a new more expensive test that will not be used for college admission or placement anytime in the near future (5-7 years). In the interim students will be required by ISBE to sit for a series of PARCC tests that trades loff with instructional time at a critical point the school year. Raise Your Hand and More Than A Score are drawing people’s attention to this amazing meeting of the Evanston Township High School District 202 Board, which took place on September 22, 2014.It’s a PARCC discussion that will leave your jaw on the table. I go to a lot of school board meetings, but rarely do I encounter people who are as knowledgeable as these Evanston administrators. It starts out with Superintendent Eric Witherspoon introducing the background of the PARCC, and then Pete Bavis, the assistant superintendent for curriculum and instruction, takes over the presentation.What follows is the most devastating, plain-language assessment of the assessment that I’ve ever heard a school official deliver. I’ve seen it twice now, and I’m still sort of numb. When you look at the totality of the PARCC implementation, what you see is that not a single part of it makes sense, until you look at who stands to profit, which comes up in this video.There are so many sections I want to point out, particularly the ELL accommodation remarks at 11:28 , but really, every moment is riveting. If you have a child in high school in Illinois, please take twenty minutes to learn about the systemic policy failure caused by the ill-advised decision to jump on this bandwagon. And the ill-advised bandwagon itself. I’ve left the questions from the board in at the end because they were excellent questions, and I believe Pete Bavis answers them with a refreshing, rare candor. This is just excellent; it’s great background and blunt criticism. The Bavis report starts at 3:55, after Superintendent Witherspoon is done with the background. That’s where it gets really pretty intense.